This one pan creamy gnocchi with sausage recipe is an easy, quick, and incredibly delicious comfort food meal. Ready in 30 minutes! It’s time for another simple gnocchi recipe! My creamy spinach and mushroom gnocchi recipe has been doing really well (it is delicious), so I made a creamy tomato gnocchi recipe recently as well. Those two recipes are vegetarian, so I decided to make one for the meat lovers out there. I’m super excited about this one too! 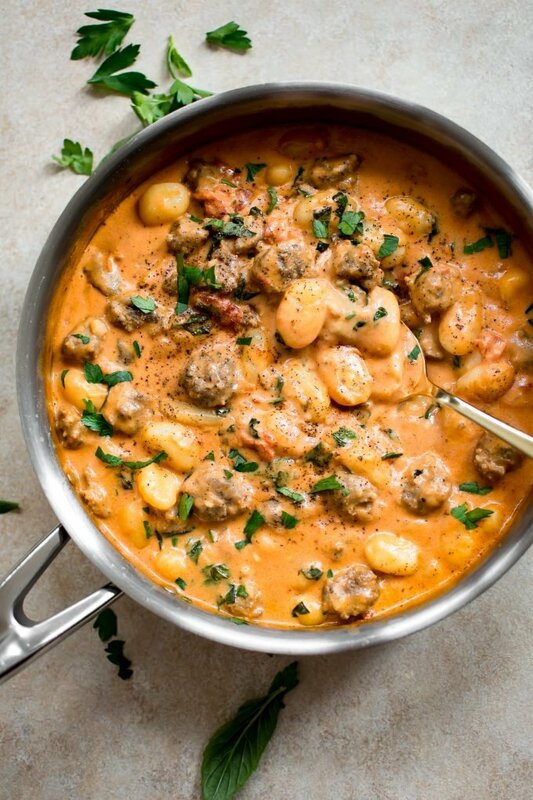 Like the other gnocchi recipes, this sausage gnocchi is a one pan wonder as well. No need to boil the gnocchi in a separate pan because it all cooks in the sauce. And this sauce is lip-smackingly good. It’s tomato-based, creamy, garlicky, and the pieces of Italian sausage take the flavor to the next level. Total comfort food. You know me… I love me some creamy sauces every now and then. This creamy gnocchi recipe also marks the last recipe I will be posting before Christmas. I will be back with a new one on Tuesday. This Italian sausage gnocchi recipe also happens to be the last decadent recipe I will be posting for a while as well. I am definitely all about having a healthy January, so stay tuned for some healthy (but delicious) recipes. Hope you love this easy gnocchi recipe! Prep your sausage and onion. Sauté the sausage pieces and onion in a skillet on on medium-high heat for 7-10 minutes, or until the sausage and onions are lightly browned. Add the garlic to the pan and sauté for 30 seconds, or until fragrant. Add the wine and let it cook for about a minute. Stir in the diced tomatoes, cream, and gnocchi. Once the sauce starts to bubble again, cover the pan and reduce the heat to medium. Cook for 5 minutes. Uncover the pan, give it a good stir, and let it cook for another few minutes, or until the gnocchi has cooked through and is nice and soft and the sauce has thickened to your liking. Stir in the parmesan cheese, basil, and salt & pepper, to taste. Serve immediately. There is no need to pre-cook the gnocchi. It'll cook right in the sauce. I bought a pack of 5 mild Italian sausages that totaled 8.8 ounces. Anything around that mark would work. Feel free to substitute with spicy Italian or another similar variety of sausage. You may also like my one-pan 15-minute creamy Alfredo gnocchi recipe. So simply to make and delicious. Doing this recipe again. Thanks, Ana! So pleased you like it! Easy and delicious!!! Thanks for this keeper! This was fantastic and my family loved it! Recipe is easy to double. I added a little Worcestershire sauce and that’s all I changed. Excellent!! So please everyone loved it. And Worcestershire sauce is a great addition. Just got done and it’s amazing! Thanks for letting me know! So glad to hear it. Yay!! So happy you liked it. Can you substitute for the white wine? I would either skip it entirely or use chicken broth in its place. I just used red wine and perfect! So happy you liked it, Tammy!! They don’t sell gnocchi in my town’s grocery store. Could I substitute for regular pasta? Just wondering how the cooking time would change… Thanks! Hi Jenna! Gnocchi is made from potatoes so it’s really quite different than regular pasta. I would have to do some testing to figure out how a one pan meal like this would work with regular pasta (I’d probably have to add more liquid). Maybe cook the pasta separately and just make the creamy sausage sauce? This was so good and everyone in the family loved it! Rich and delicious. Definitely comfort food. Can I substitute milk for the whipping cream? Hi Lisa! I’m so glad everyone enjoyed it. You could try substituting milk in, but the sauce may be quite a bit more watery and less creamy. You may need to adjust cooking time accordingly to let it cook down a bit more and thicken up. Maybe try half-and-half instead? Or experiment and let me know how it goes haha. This may be a silly question, but do you use boxed gnocchi or fresh? Also, can a dense pasta such as gemelli be substituted if gnocchi is unavailable? Thanks! Can’t wait to try this! Hi Meghan! Not a dumb question at all. I buy the gnocchi that’s found in your standard pasta aisle in a grocery store. It’s usually packaged in those see-through containers. If you can get your hands on fresh gnocchi, then even better! I’m not sure I’d do gemelli unless you cook it separately first. Reason being, the gnocchi is made of potatoes and tends to release quite a bit of starch while still cooking really quickly. Pasta will too, but I’m not confident that the one pan method will work without adding extra fluids (and that requires some testing vs. me just guessing). Hope this helps and that you enjoy the recipe! Do you think I could substitute the cream for creme fraiche? Hi! I can’t say for sure what the results would be, but you could give it a try. Fantastic, I added mushrooms and spinach. Changed nothing else. The flavors melted together well, next time I’ll try adding some crushed red pepper. So glad you liked it, Bob! Those sound like tasty additions! Wonderful! So happy you liked it. Thanks for sharing. And I love mushrooms so that addition sounds fab! This was easy and delicious! Will become part of our regular rotation. Thank you! Excellent! So pleased to hear that, Julie! This was beyond fabulous! And it was truly easy and all in one pan! Would frozen gnocchi work to cook in the sauce as well? Or would you cook separately and then cover in the sauce? I think frozen gnocchi should work fine, you just may need to cook it for a little longer. I’d probably reduce the heat a tad and cook it for a few more minutes. This is delicious! I used sweet Italian sausage. I want to try it with rotisserie chicken soon. Wonderful! Using rotisserie chicken in here is a great idea! This was sooooo good! I doubled the sausage using Italian style chicken sausage and doubled the onions. It was even a hit with my 16 year old son and he is SUPER picky! Definitely a winner and new addition to the recipe book! Have you ever made this in a crockpot? I haven’t. I’m concerned the cream sauce might separate.